The present Ebola scare has been going on since March of 2014 and is the most severe in terms of recorded human cases since 1976… by a MASSIVE margin. The CDC has laboratory confirmed cases at 3974, and has spread through multiple countries now confirmed to have reached the United States. (this is as of October 2014). 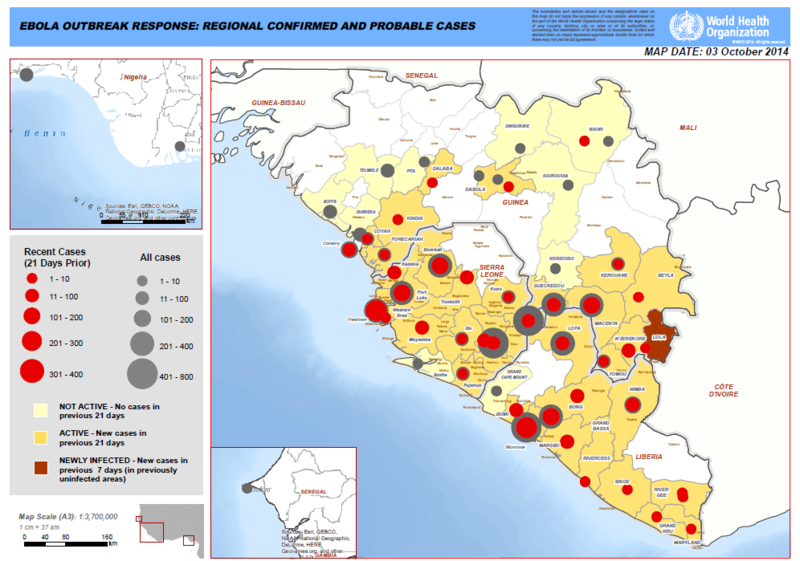 The following map from the world health organization shows the current confirmed and probable cases in this current West African Ebola outbreak. Ebola Virus in the US? The CDC confirmed the first travel related case in the United states. An individual who had traveled to West Africa and returned to Dallas Texas began exhibiting symptoms 5 days after their return. The Ebola virus is only contagious if the person has begun to exhibit symptoms, so upon suspecting Ebola this individual was quarantined. The CDC, and US hospitals are taking this extremely seriously using meticulous infection control and ensuring anyone in contact is being monitored daily. They have identified 10 contacts, and 38 possible contacts (as of October 4, 2014). Unless you are in a West African hospital, I wouldn’t. If ONE person has an infectious disease – the reproduction rate tells us how many people on average will be infected by that ONE person. In the case of Ebola an infected person typically passes it on to 1.5 to 2 people. The math shows you that even with an R0 rating of 2, Ebola has the potential to spread exponentially. 1 person becomes 2, 2 become 4, 4 become 8, 8 become 16, and so on and so forth. The truth is though, Ebola is only contagious for about a week, and is only spread by close physical contact with bodily fluids that contain the virus. So basically… as long as hospitals are vigilant and organizations like the CDC stay on point, there is no reason for Ebola can’t be contained easily in the western world. National Public Radio or NPR put out a tremendous article that explains this whole concept succinctly, and with a tremendous graphic I’ve placed below. This graphic belongs entirely to NPR.org and clicking it will bring you to their article which I highly recommend. Stay healthy, keep a strong immune system, and follow the glutathione pathway!